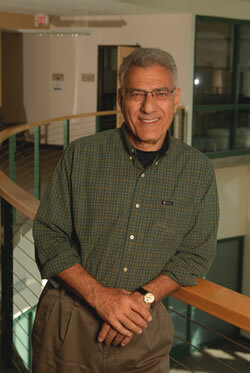 In March 2012, it was announced that Stephen Hanessian had won the 2012 IUPAC-Richter Prize in Medicinal Chemistry. Hanessian was chosen for his outstanding achievements in natural product chemistry, his chiron approach to chiral compound synthesis, and his many seminal contributions that have facilitated the synthesis and discovery of medicinally active compounds and novel drug prototypes. Hanessian has been a full professor since 1969 in the Chemistry Department at the University of Montreal and currently holds their Isis Pharmaceutical Research Chair. He also holds faculty positions in the Departments of Chemistry, Pharmaceutical Sciences, and Pharmacology at the University of California, Irvine, where he is also director of the Medicinal Chemistry and Pharmacology Graduate Program. He will receive the award, which includes USD 10 000, and present a lecture at the 33rd ACS National Medicinal Chemistry Meeting in Tucson, Arizona, on 21 May 2012. He will also lecture at the XXIInd EFMC International Symposium on Medicinal Chemistry to be held in Berlin, Germany, 2–6 September 2012. Hanessian is a fellow of the Royal Society of Canada (1988) and has received the Canada Gold Medal for Science and Engineering (1996) and was appointed Officer of the Order of Canada (1998). Among his many awards, he has received the Bernard Belleau Award in Medicinal Chemistry (Canadian Society for Chemistry in 2001) and this year will receive the 2012 Ernest Guenther Award in the Chemistry of Natural Products. Stephen Hanessian obtained his Ph.D. at Ohio State University in 1960 and then spent seven years as a research chemist at the Parke-Davis Research Laboratories in Ann Arbor, Michigan, before moving to the University of Montreal. He has collaborated for research with many pharmaceutical companies and has around 500 research publications.